This is not a good thing! The point is to stay within your contract limits. When you go over, there are extra charges. Our contract allows 5 Gigabytes of data usage per month. Check the image at right and you’ll see that we’ve used over 4 Gigabytes and we’re only on day 8 of 31! Looks like I’ll have to go on a data diet for the rest of the month. Data usage is simply Internet use as opposed to voice. Voice plan usage from your cellular provider is measured in minutes, Internet/Data usage is measured in Megabytes/Gigabytes. Data usage is also referred to as Downloading, Uploading, or Bandwidth. Think of it like a stream of water going thru a hose, email and other text is just a trickle, video is a firehose. You’re measured by how much data is going thru the connection – what you’re looking at, not the time you’re online. Each Gigabyte is roughly 1,000 Megabytes. We teach people that 5 Gigabytes is usually plenty for a month of one person doing normal browsing, email reading and maybe some Youtube watching. But, if you share that connection with multiple computers, or you watch a lot of video, then 5 Gigabytes won’t be nearly enough. Just to give you an idea, a large, high resolution picture that you view on the web may consume about 1 Megabyte. You’d have to view 1,000 of those pictures to hit one Gigabyte of usage. Over the period of one month, you might view 1,000 pictures on the web. Watching a typical, standard quality, 3-4 minute Youtube video will use roughly 10 Megabytes. So you could watch 100 of those for 1 Gigabyte of data usage. See this article from the folks at evdoinfo.com for a chart: What does 5GB (Gigabytes) Get Me? Here’s another article for more detailed info on data usage for videos. The only thing we tell people they cannot do is to watch full length movies. Watching one Netflix movie online can easily use up to 2 Gigabytes of your allotment right there. How Did We Go Over Our Limit? We had not watched any online movies, so how did we rack up so much data usage so fast? First of all, for the whole winter season, we were in one RV park where we contracted with Bell South for a DSL line. DSL is nice and fast and has no limits. So, we got spoiled. We didn’t have to pay attention to data usage all winter. Now that we’re back on the road, we need to be paying attention. Both Jim and I are sharing our mobile hotspot Internet connection from Verizon. Once I got a notice from Verizon, I did some checking. One culprit is my Windows Updates. I had automatically received Windows 7 Service Pack 1. I checked Microsoft’s site and learned that it was over 1 Gigabyte in size! We are also preparing to deliver a seminar remotely using Skype and screen-sharing. Our practice session probably cost us us a 1/4 Gigabyte. A couple days ago, I purchased the latest Microsoft Streets and Trips program and downloaded it. That was 1.3 Gigabytes! Pretty stupid on my part since I already had the trial version installed on my computer. We now have a 4G mobile hotspot from Verizon and we were so excited to be in a 4G area around Nashville … I may have watched a couple episodes of Glee on Hulu because it worked so well … hey, I call that research! What Can You Do to Limit Your Data Usage? Always check for good Wi-Fi and use it when possible. 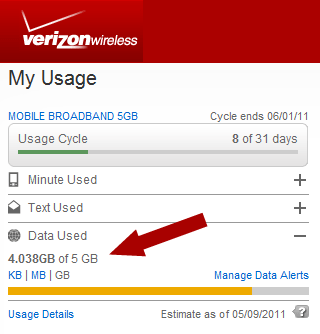 Stay aware of our current data usage by checking our account stats online at verizonwireless.com/myverizon and logging into our account. If you don’t know how to do that for your provider, give them a call and ask. Turn off automatic Windows Updates (Control PanelSystem and SecurityWindows Update) note: if you do this, make sure to do your updates manually whenever you’re in a good Wi-Fi area. Getting updates *is* very important. Turn off Carbonite online backup. I love Carbonite, but it *does* use bandwidth to backup all new files I create to the backup website. Since we’ll be on the road for quite some time, I’ll probably turn off the service completely and just use our ClickFree for backup. Turn off DropBox. DropBox is a great utility that synchronizes a folder of data across multiple computers. It does this by uploading them to a website and then downloading them to the other computers, so it uses double bandwidth (data transfer usage) going up and down! If I remember, I’ll turn it back on when I’m connected to a good Wi-Fi signal. Limit our Video Skype calls. How Much Does it Cost When you go Over Your Allotment? Verizon used to charge 25 cents per Megabyte of overage. That adds up quick! If you went over by a Gigabyte, that would cost $250! The fees today are much more reasonable – each Gigabyte of excess will be charged at $10/Gigabyte. Check with your provider and your contract to see what your overage charges are. If you’ve had your contract for a long time, you may even have an unlimited usage contract. If that’s the case … don’t lose it! Any change in your contract may get you started with a whole new contract – with new limitations. The unlimited usage contracts are highly desirable. Can I Increase My Limits? This depends on your provider and the plans they offer. Verizon does currently offer a 10Gigabyte contract for $80/month. We might just have to do that. Kind of like those real diets … so often I give up and go buy some clothes in a larger size! 2014 Update: We now use our Android smartphones as hotspots rather than the MiFi device. Our smartphones have a grandfathered UNlimited data plan, so we don’t have to worry. Published by MrsGeek, in Blog. Tagged with carbonite, Clickfree, Dropbox, Verizon, What is a Gigabyte. We have moved on from Tennessee to Ohio and we’re in the country with no 4G, so we’re back to tethering our Droids – that’s 3G. The data plan on the Droids is indeed unlimited! We did increase our plan for the mobile hotspot to 10Gigabytes/month and we’re currently at 9.88 with a few days left in the month. So, we’re glad to have the Droids as Plan B. Is there any roll-over on the 4G plan? There is no roll-over with Verizon. Great information, especially the part about DropBox. I hadn’t thought of that. Maybe I need that clickfree afterall! Don’t you ever tether your Droid anymore? I’m surprised you are not tethering your Droid phones. . .it works as well as the “Air Card.” It’s unlimited, and it’s already included in your monthly fees for your phone. Tethered use is data use and subject to whatever data plan you have. I still have unlimited data. Shhhh….keep it quiet, don’t tell anyone….somehow I’m grandfathered into an UNLIMITED data plan through my Verizon account. I know that these are no longer available, and I’ll milk this as long as I can! We too are grandfathered but Verizon has a nasty habit of slowing us down if we go over 5 GB. I’ve called them three times last winter before they finally agreed not to throttle us back. It’s all good now……until the next time!